The “Steamer” Style Regimental Trunk for the RCMP, CAF and other agencies, including the Vancouver Police Department, Ontario Provincial Police, etc. Our products are uniquely designed and hand built in our workshop, located in Surrey, BC. We pride ourselves on quality and have ensured each of our products is handled with care from start to finish. We hope you enjoy browsing our site and would love to hear from you. The regimental trunk is uniquely designed and hand crafted to reflect the classic RCMP steamer trunk. 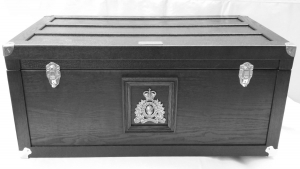 Each trunk is carefully constructed with high quality hardwood and is elegantly finished with the appropriate RCMP/CAF/VPD/OPP crest, leather handles, unique serial number, and a removable tray. 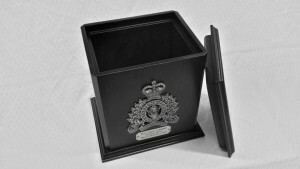 Handmade and crafted from solid oak or cherry, these urns bear the RCMP or CAF crest and a personalized nameplate.They are fully compatible with the RCMP columbariums in “Depot” Division as well as at Beechwood Cemetery, the Ottawa-based National Military/Memorial Cemetery of the Canadian Forces and the RCMP. Admin2018-11-17T13:12:27+00:00March 9th, 2018|Comments Off on New Look For Trunks Available!